Exotic chocolates with a cornucopia of flavors, from Vosges Chocolate. KAREN HOCHMAN, Editorial Director, and PETER ROT, Chocolate Reporter, work together to bring NIBBLE readers some of the most exciting chocolate content anywhere. This article is a work of original scholarship as well as part of their commitment to educating others to more fully enjoy the nuances of fine chocolate. If you want to be able to describe chocolate the way experts do—similar to the way wine connoisseurs describe wine—you’ve come to the right place. This is Page 1 of a four-page article on understanding the taste and smell of chocolate—the many different flavors and aromas in quality cacao. We begin with an overview to fine chocolate. Click on the black links below to visit other pages. When you purchase the world’s finest chocolate, you are buying bars, bonbons or truffles made of the finest beans in the world. These beans—Criollos, Trinitarios, and some subspecies of Forasteros—largely come from the tropical rainforests of West Africa, the Caribbean, Ecuador, Java, Madagascar and Venezuela. The soils and climates in which they grow produce beans that yield the greatest aromas and nuances of aroma and flavor. When you unwrap a bar made of these great beans, you immediately know—because of the complex aromas wafting up—that this is not a bar of ordinary chocolate. Studying chocolate, like studying wine, takes time and focus to understand the different terroirs and the flavors they yield. In Part I below, we review the attributes you’ll find in fine chocolate. On Pages 3 and 4, we discuss the different regions of the prime growing countries, and the characteristics typical of their beans. These descriptors in the charts on Page 2 and Page 4 of this article were developed by Chocolate Reporter Peter Rot and Editorial Director Karen Hochman. If you have comments, questions or suggestions, use the Contact Us link on this page to send them an email. 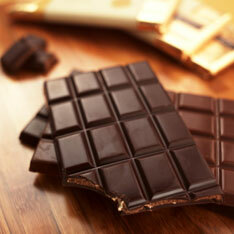 Also see our Chocolate Glossary, which answers many questions. With a variety of complex flavors found in each bite, fine chocolate offers not only a wonderful taste experience, but the opportunity to develop true connoisseurship. We’ve developed a chart that categorizes the flavors and aromas found in chocolate. Of course, only some will be found in each piece; but chocolate from the same origin should in general have similar characteristics (citrus and robust, e.g., vs. tobacco, caramel and blueberry). Bittersweet Chocolate (70% cacao or more) has the most chocolate liquor and the most intense chocolate flavor. Look for bitter, roasted, fruit, earthy, woodsy and/or nutty notes. The aftertaste can be bitter, intentionally so. *In theory, the range for semisweet chocolate would extend to 69%; we have seen bars at 68%. American standards differ from International standards; American standards consider chocolate “bittersweet” at 50% cacao. This standard is old and needs to be revised. Milk Chocolate (30% to 45% cacao†) is milder and sweeter because it is made with milk and a higher sugar content than the darker varieties. It also has a smaller quantity of chocolate liquor and, therefore, fewer flavors and aromas. Look for brown sugar, milk, cream, cocoa, vanilla, honey, caramel, nutty and/or malt flavors. †With growing connoisseurship, there is a rising trend towards high cacao content milk chocolate, some of which reaches levels of 70%. Check out the LatteNero line from Slitti. In theory, the range of milk chocolate would extend to 49%.